IMAGINE – living in our neighborhood with its tree lined streets, sidewalk cafes, and shops. EXPLORE – the vibrant surroundings of Historic Old Webster with its beautiful Century Homes, its love of the arts and its commitment to both progress and preservation. 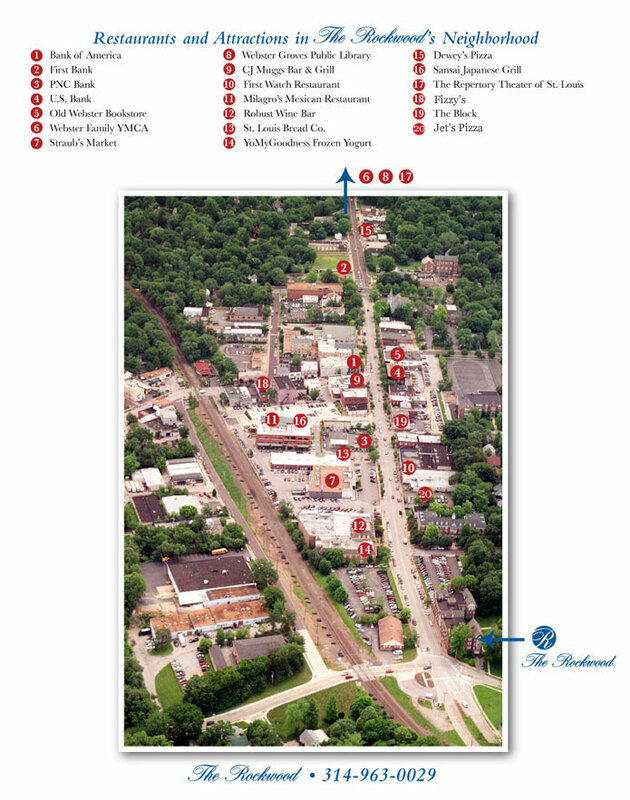 DISCOVER – The Rockwood’s community with its restaurants, shops, churches*, banking, florists and professional services. Stroll along the street where we live where you are truly “steps away” from all Historic Old Webster has to offer. If strolling along the avenue is not your favorite mode of transportation, let us know. We’ll transport you to your destination (no walking shoes required). Nearby Churches (Webster Groves Presbyterian, Holy Redeemer Catholic, First Congregational, and United Church of Christ Church) are less than a mile from The Rockwood.